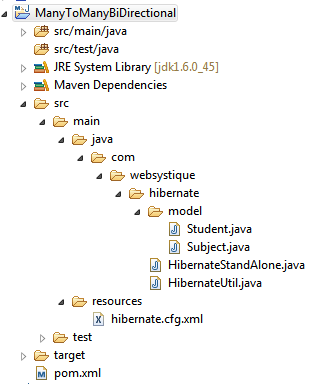 In this tutorial, we will learn about how to use Hibernate Many-To-Many Bidirectional mapping using annotation based configuration. In Many-To-Many association, an extra table is used (known as Joined table) whose primary key is the combination of primary key of both the associated tables.In other words there is a foreign key association between the joined table and the associated tables. Schema Setup of ManyToMany bidirectional is same as of ManyToMany Unidirectional. We are discussing an example of Student and Subject relationship. A student can enroll for multiple subject. And a subject can have multiple students enrolled for it. We are considering Bidirectional mapping, means both side navigation is possible. Let’s get going. [Note that this schema is exactly same as the one for ManyToManyUniDirectional. NO CHANGE]. Here we have first created the main tables STUDENT & SUBJECT. then we have created a joined table STUDENT_SUBJECT whose primary key is the combination of primary keys of STUDENT & SUBJECT. 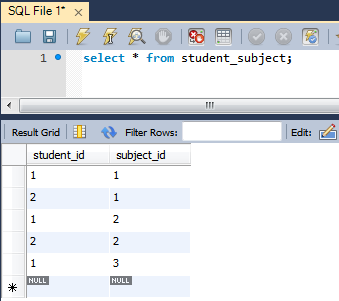 Model class Student & Subject are simple POJO class which is annotated with JPA annotations to map it to a database tables(created in step 1). Only change in this relationship( ManyToMany Bidirectional) and ManyToMany Unidirectional is that, in the Subject class we have added following property. Nothing else changes.We added this property in Subject class to make the relationship bidirectional.You can now navigate from Subject to Student.mappedBy attribute tells that this is the inverse side of relationship which is managed by “subjects” property of Student annotated with @JoinColumn. @ManyToMany indicates that there is a Many-to-Many relationship between Student and subject. A Student can enroll for multiple subjects, and a subject can have multiple students enrolled.Notice cascade = CascadeType.ALL, with cascading while persisting (update/delete) Student tuples, subjects tuples will also be persisted (updated/deleted). 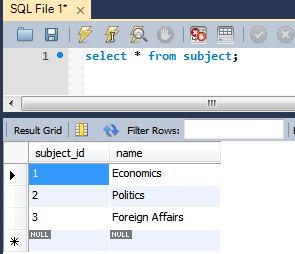 @JoinTable indicates that there is a link table which joins two tables via containing there keys.This annotation is mainly used on the owning side of the relationship.joinColumns refers to the column name of owning side(STUDENT_ID of STUDENT), and inverseJoinColumns refers to the column of inverse side of relationship(SUBJECT_ID of SUBJECT).Primary key of this joined table is combination of STUDENT_ID & SUBJECT_ID. One important remark : In case of *Many* association, always override hashcode and equals method which are looked by hibernate when holding entities into collections. Here you can see that we have set the subjects property of Student class, and just persisted Student objects.Thanks to Cascade attribute, Subject tubles will be persisted automatically. 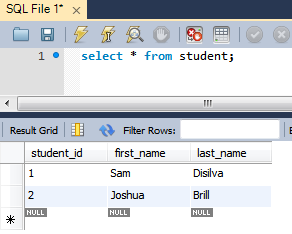 And due to the annotation mapping we have done above in student class, a new tuple will be created in joined table (STUDENT_SUBJECT) for each combination of student & subject item we dealt with in main program.